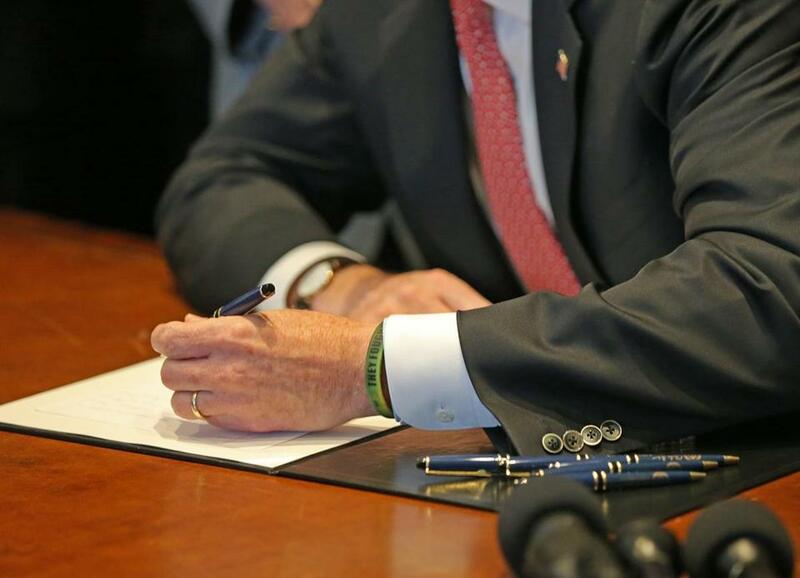 Governor Charlie Baker signed into law Tuesday a bill that will give courts the authority to strip weapons from people who have been identified by their families as a danger to themselves or others. Governor Charlie Baker on Tuesday signed into law a bill that gives courts the authority to strip weapons from people who have been identified by their families as a danger to themselves or others. The new statute strengthens already strict gun laws and makes Massachusetts the latest state to respond to a national spate of mass shootings with more restrictions on firearms. Baker, a Republican, signed the “red flag” legislation at the State House surrounded by Democratic legislators, police officers, mothers who have rallied for stronger gun laws, and a Cambridge Rindge & Latin School student who had been advocating for the bill. “Even in a state like ours, which has made tremendous progress on this issue, when there’s more to do, we do it — and we do it in a way that gives everybody the chance to be heard,” Baker said. But local and national gun rights advocates said they were upset about the law, which gives judges the power to issue an “extreme risk protection order” taking away a person’s guns after a family member, current or former romantic partner, housemate, or local police official signs an affidavit saying the person may pose a risk of causing bodily injury to themselves or someone else. It “does absolutely nothing to provide help to people who may be suicidal. It also does nothing to keep homicidal monsters away from our children,” said Jim Wallace of the Gun Owners Action League of Massachusetts. An earlier version of the legislation specified reasons, such as dangerous mental health issues, why a judge might grant an extreme risk protection order. The new law, however, gives a district or Boston municipal court wide discretion. A hearing must occur within 10 days after a person has been red-flagged. After, if a judge finds by a preponderance of evidence that the person poses a risk of causing bodily injury to themselves or others by having a gun in his or her ownership or possession, the judge must order the person to surrender all firearms — and the right to legally obtain new ones — for up to a year. Under the new law, a judge can also issue an emergency extreme risk protection order before the person whose guns are taken away has a chance to make his or her case. That’s sensible, advocates say, because the law wouldn’t work to protect public safety if a suicidal or homicidal person could hold on to his or her weapons for up to 10 days. Decker and other advocates say the law will save lives by, for instance, taking guns away from people who are suicidal, preventing some of them from going through with the act. The law requires that a court provide information about counseling services, substance abuse disorders, and involuntary hospitalization to people who have been flagged by their family or housemates as a risk, and to those doing the flagging. But it does not require people who have their guns taken away by a court to get mental health treatment of any kind. Massachusetts joins several states in having a red flag law on the books. According to Everytown for Gun Safety, an advocacy group, California, Connecticut, Florida, Indiana, Maryland, Oregon, Vermont, New Jersey, Rhode Island, Delaware, and Washington have such laws. Advocates cheered what they framed a big leap forward. According to data from the Centers for Disease Control and Prevention, Massachusetts had 242 firearm deaths in 2016. That meant 3.4 deaths per 100,000 people, a lower rate than in any other state, according to the CDC.